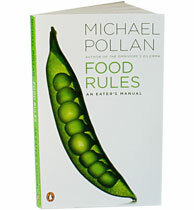 I was always interested in reading Michael Pollan’s small book of food habits and what to eat and how called, “Food Rules: An Eater’s Manual”. I somehow never got around to it. Perhaps I was scared that it would all be clear – what I eat is unhealthy and maybe I would be forced to think about what I eat, how much I eat and how I eat. I was certain that life would not be the same after reading this book and I was right to a very large extent. At the end of the book, I wanted to change the way I eat and I hope I do. “Food Rules” is a book that pretty much tells you what you already know. It deals with the basics or rather it gets to the basics of food and our dietary habits. The book is divided into three parts and each part tells the reader a little more towards healthy living. At the same time, Pollan does not discourage eating something sinful or pampering oneself, once in a while; however we need to understand that it is just once a while and not every single day. I guess that is where the major difference actually lies. The basic premise of the book (according to me) is that eat what your grandmother or your ancestors would recognize as food. The idea is to rid oneself of processed foods or anything that comes in a can or a bottle. Eat fresh and eat plants and vegetables is at the core of the book and rightly so. There are sixty four rules in the book and one might even ask: Do we need rules to eat? Does someone need to teach us what to eat and how to eat? The answer to these questions in today’s time and age is probably a big, fat, YES! Pollan stresses on chewing food, eating smaller portions, eating together and simple food wisdom which he has observed from various cultures and applied over the years. “Food Rules: An Eater’s Manual” is not a ground-breaking book. However, it does make you realize how you have been abusing your body and mind with what you eat. It makes you realize that supermarkets aren’t the answer to all your food needs and neither eating more means that you are well-fed. It looks at the basic aspects of eating – how much to eat, and when to eat. It breaks the myth of different foods and what the concept of healthy and fit really is. Pollan draws from traditions and simple food wisdom, which I said before, we are all aware of more or less but forget to apply it somewhere down the line. May be that is why we need a book like this to keep informing or rather reminding us from time to time, about what we should eat and how. A must read for people who want to know more about food and its implications and how it changes lives. This entry was posted in Books, Food, Health, Non Fiction, Penguin Books, Review and tagged An Eater's Manual, food, Food Rules, Health, Michael Pollan, Nutrition, penguin books, wisdom on November 14, 2013 by thehungryreader.